Copy of Mana Tangata — OMGTech! The Mana Tangata programme selects 30 students from communities around Aotearoa NZ that are not well represented in tech and pairs them with an awesome tech industry mentor. Together you create the path to become a future technology leader. OMGTech!’s Youth Leadership programme kicks off with a hands on interactive training workshop through a weekend course held in Auckland. We look after getting all our mentees to this. This is then followed by 6 months of being paired with a mentor who is currently working in the science and technology sector. Through this mentorship youth will develop core leadership skills as well as further their learning journey in the tech field of their choice. They will understand where they could go and how they can get there. OMGTech! will also provide the platform & resources for the leaders, as part of the programme, to set up a technology focused initiative within their local communities, This can be a youth focused event as at a library, Marae, school or community centre or a tech project aimed at helping their community through technology. This will be a student led initiative that will feedback into the community the leadership and tech skills that the youth has gained during the programme. The programme started in April 2018 and will run for 6 months. If you are interested in being part of the programme in 2019 express your interest below! 𝐘-𝐭𝐞𝐜𝐡𝟐𝐤𝟏𝟖! Event organised by 6 participants of the 2017 Mana Tangata programme. I am a seventeen year old student, born and raised in South Auckland. I have an interest in technology, especially because of the lack of woman representation in the sector. Through OMGTech, I have had a mentor to help me navigate through my year. She has taken me to various companies to learn the reality behind the tech industry. It has been an amazing experience meeting new people and forming bonds. I have helped organise a VR event at my school, with OMGTech’s guidance. Their connections and networks have benefit the members in the programme tremendously. OMGTech have taught me to get out of my comfort zone, which is something that I’ll be grateful for forever. I am a 16 year old student from hawks bay who, by this time will be studying my bachelors in computer science. I have a twin brother named Finn and he will be studying with me next year. My brother and I worked on a pollution monitoring system for OMGTech and worked on it with my mentor and my brothers mentor Alfonso and Mike. I have a interest in mechatronics and have built many robots over this year, I also have an interest in industrial 3D modeling, programming and gaming. Thanks for reading my lil bio. Kia Ora my name is Nuhaka i’m from Mangere in South Auckland, I like to play instruments and play games on any platform of technology except for nintendo. I Joined OMG Tech hoping to find grounding on maybe what I want to be and do in the future. After joining the group I had realise that it’s really hard doing something if you don’t have support. I think everybody in the group had a lot of fun doing things that stimulate their brains. I try as hard as I can to make friends, and always try as hard as I can to do something I am not comfortable with doing. I always enjoy spending time with my friends and family. I encourage people to join OMG Tech it is a great experience and it could be a new learning journey. Kia Ora. Ko Awhina-Tawera toku ingoa, he uri tenei no Te Arawa. Next year I’ll be a Year 13 student at Te Wharekura o Manurewa. At the end of April 2018 I came to OMG Tech, not knowing anything about the organisation or programme.Throughout the programme I have gained technology and computer skills, created a bond with people I usually wouldn’t associate with and have created so many wonderful and lifelong memories. Now that the programme is coming to an end, I will leave with lifelong friends, an amazing experience, and a new family. Chom Reap Sour( Khmer Greeting) everyone, I'm a seventeen year old boy that is proud to be a second generation Chinese Cambodian. Living and growing up in South Auckland was such a big thing for me. The pride in everyone roots and tradition has always stuck with me. In which through OMG tech, I have decided to create a project combining technology advancement to express my pride and love for my own culture. My project is based on creating an app to bring awareness about the Khmer Culture and language, but as well to keep the culture and language alive, eventually allowing Khmer speaker and Second Generation Khmer kids connected with each other. I can't thank OMG tech enough for the support and experience they have offered me and the other students thats has participated. It was such an amazing journey pairing us up with mentors that helped us with our project. OMG Tech has helped me go on amazing journey of meeting amazing people that are my age and inspiring each other. activism and learning. The reason I joined the Mana Tangata programme was to learn about technology and computers which with the help of my mentor Tash, the programme coordinators like Mati and the other kids I was able to do. I came into this programme not knowing a lot about technology and computer science but I have come out of it being able to hold a conversation about the subject; something I am very proud of. Being a part of this programme allowed me to view a career in the technology sector for myself as a possibility which I find empowering. Again, thank you to my Mana Tangata whanau for inspiring me to learn about technology. I learnt a lot of new things through this programme and formed bonds with so many cool people. Thanks for reading, Elmira. Tena koutou katoa. Ko Rangipo Takuira-Mita toku ingoa, he uri whakaheke tenei no Ngati Maniapoto raua ko Te Arawa tenei. 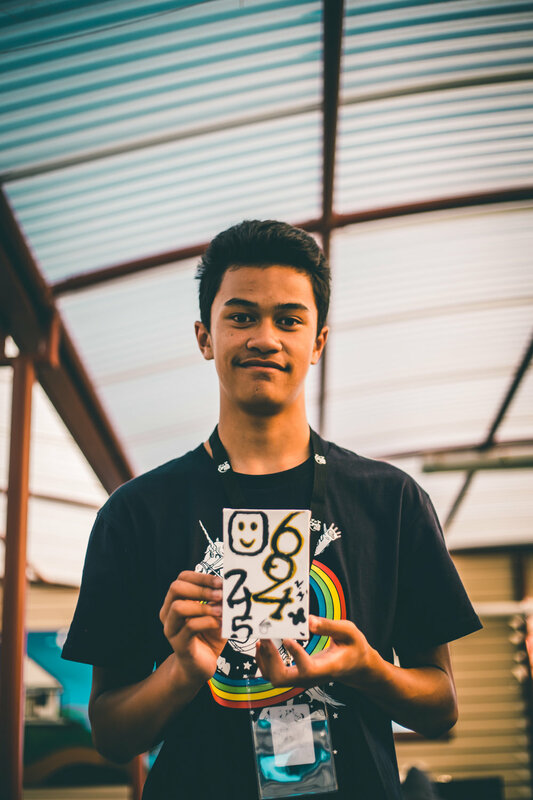 This year I am currently a student who attends Te Wharekura o Manurewa and also a year 12 I am also one of the students who have recently completed the Mana Tangata programme long side of OMG Tech, I was also a student who came to the Mana Tangata programme not holding any knowledge of Technology. Through out the programme I have gained more skills in the area of Technology with in computer skills, and also app design I've made a whole new family and made life long friends with people you wouldn't usually see me with and memories that will never fade. "Tuia ki te moana, tuia ki te rangi, tuia ki te whenua, tuia te herenga Tangata." With the app design skills I was able to design a app called "Te Kete Matauranga" the app would be created to be based on water in this app I would like to show people how my tipuna used water, the up cycle of water, and also the beginning to finding weather there's a ending to water, by doing this I would look for hitori, and collect information from water testing kit. This app could be useful information not only for biologist but for everyone. After years go past we would also like to add information about the sky and earth and the impact they all have on one another. Hi, my name is Finnian and I worked with my brother Arran and my mentor Mike to create a pollution monitoring system. This system was based of Arduino hardware and was coded in C++. Everything we made was and now is open-source and is on our website here https://healthy-cities.github.io/ this is where we have a 3D printable model, code and a hardware list. In 2019 I will be starting my bachelor degree in computing systems with a major in intelligent systems and im looking forward to it. Thanks for reading and good luck with any future projects/study. Hi my name is Orin and i’m from Napier. I really enjoy drawing and singing. My pictures are mostly scary and creepy. I came to the OMGtech because I want to learn more about Animation. So in the future I want to create 3D games and I want to Animate song. I like being creepy and scary so I got some coloured lenses I got white the next ones I want is Red, Blue, Black, Purple and Green. I get really Ticked off when my friend’s get hurt by other people or if they are sad if that happens I try to make them happy and defend them I like seeing them sad there was this one time I did the split’s just to make my best friend smile, it hurt like hell but it was worth it. My first best friend we meet when we were 10 months old we went to the same kindy and school we’re still in the same class I’ll do anything to see her smile and happy. My name is Te Ahikapua Hape-Maui and i have recent completed the mana tangata programme through OMGtech. This was a great experience for me as it provided me with many connections into various organisations that were able to help me achieve my goals. Great staff who are not only are good to talk to too but also have the experience and expertise to help with whatever problem you may face. An overall beautiful organisation with beautiful people doing beautiful things. My app I developed was purely created to help those with irlen syndrome for a cheaper price. It uses different colour schemes that’s your able to alternate to your selected choice. It’s a quick and more affordable option then paying for the $500 dollar glasses. The idea popped into my head one night and I grabbed the ball and ran from there.